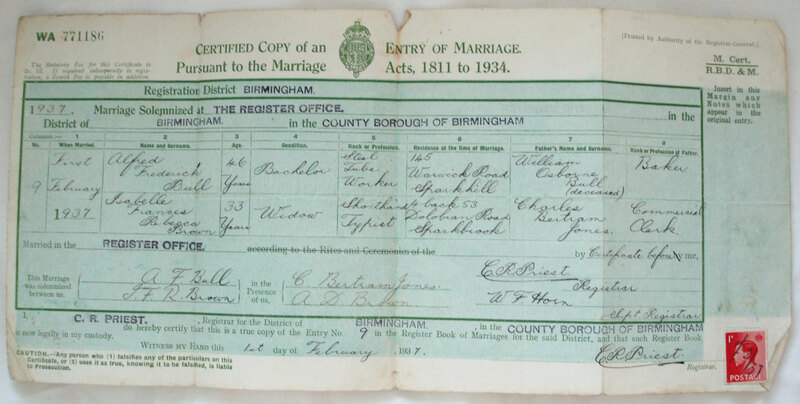 Information gleaned from my maternal grand-parent’s marriage certificate indicates that Isabelle Jones first married a man with the surname Brown. Further research supports the family story that Isabelle and Albert were introduced to one another by the relatives of Isabelle’s first husband, Charles Henry Brown. To complicate matters Charles’ brother, George Brown married Alfred’s sister, Ann Dorothy Bull. OK, there are too many relationships in that sentence, so I want to draw a chart that helps me visualise them. 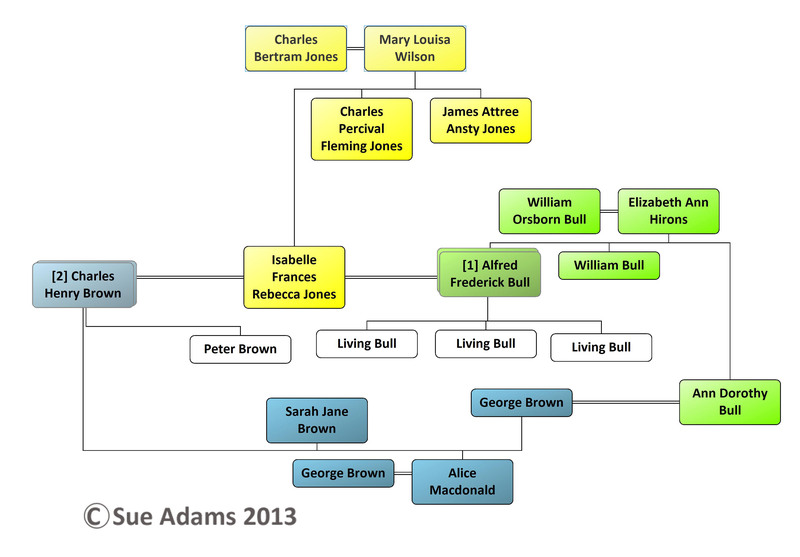 Notice that Alfred Frederick Bull and Charles Henry Brown appear twice and the chart has two separate ‘trees’. I have colour coded the three families for clarity. FTM 2010 allows manipulation of charts, so I fiddled around to try to represent this family on one joined up diagram with no crossed lines. Although it seems clearer to me, it might not help anyone else. It breaks the conventional placement of older generations at the top by turning the Browns upside down. What do you think? However, people such as Isabelle’s son-in-laws and grand-children will not fit. The glaring problem is the lack of scalability. It is not as intuitive as conventional genealogical charts, but it copes well with complex relationships and is scalable. I used the highlighting feature to mark the same 3 families. The GeneaQuilts website claims two genealogy programs have implemented the charts. Unfortunately, neither is functional. First, Progeny’s Charting Companions for FTM, PAF Ancestral Quest and Legacy features ‘Trellis charts’. I downloaded and installed the evaluation version Charting Companion for FTM, but the program presented an error message that indicated I should update FTM 2010 to 19.0.0.207 on start-up and failed to open the data file. The latest version for FTM 2010 is 19.0.0.206. Second, Geneapro’s own website states that it does not provide the full functionality yet. Furthermore, I failed to install this software, due to inadequate documentation on external tools required.